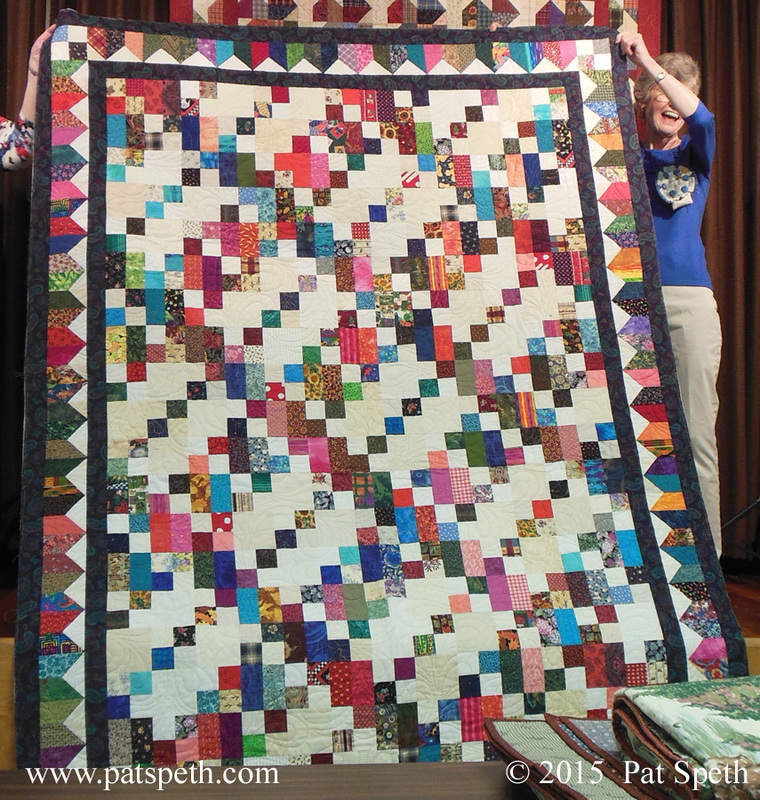 I just finished up two great days with the Faithful Circle Quilters Guild in Downers Grove, Illinois. 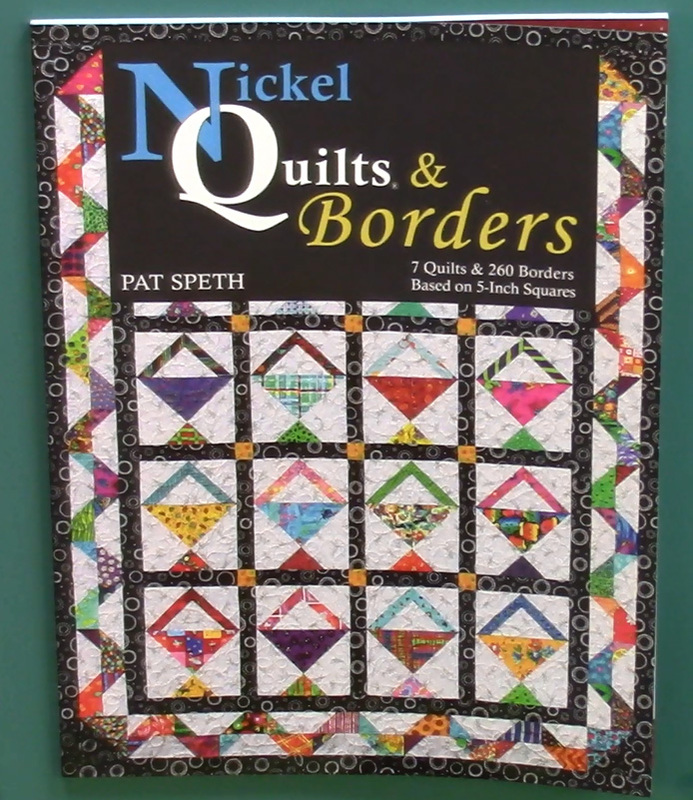 I presented my Fabulous Nickel Borders lecture for their guild and at show and tell I was treated with seeing one of my designs made by a guild member. 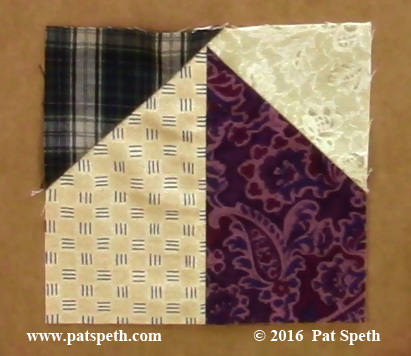 This is Four Patch Plaid and is found in Nickel Quilts or The Big Book of Nickel Quilts. 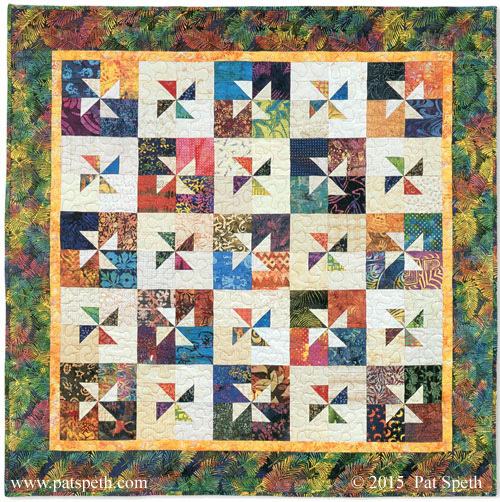 I love the very scrappiness of this quilt! 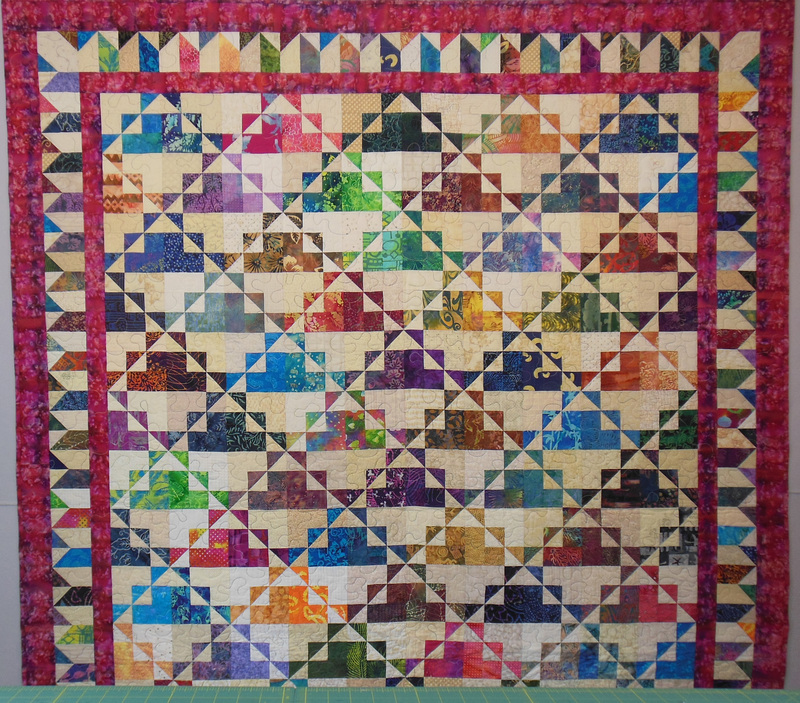 The workshop they selected was my Picket Fence Units workshop in which five different quilts can be worked on all in the same workshop! 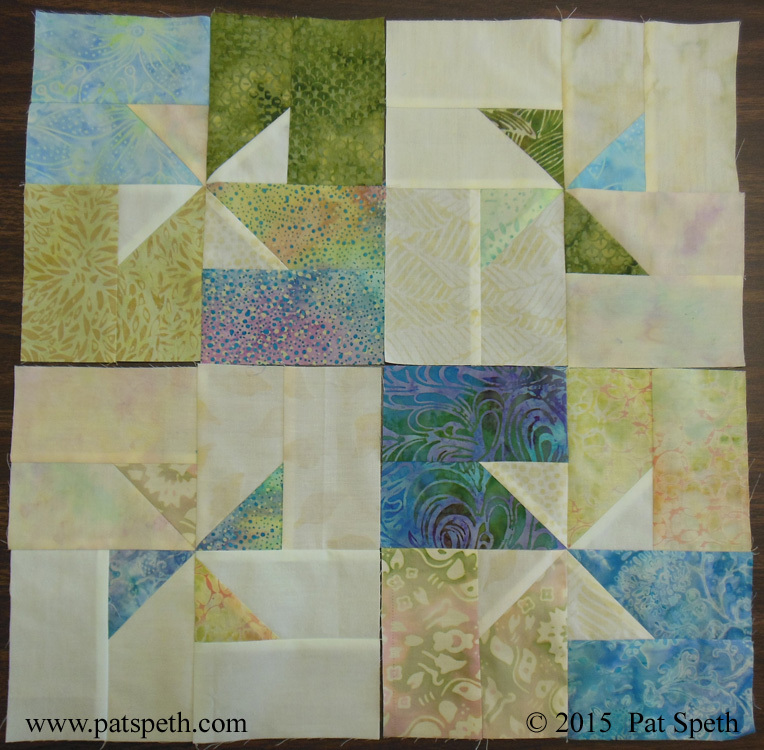 These are some blocks from the Chesapeake and Dawn to Dusk quilts. 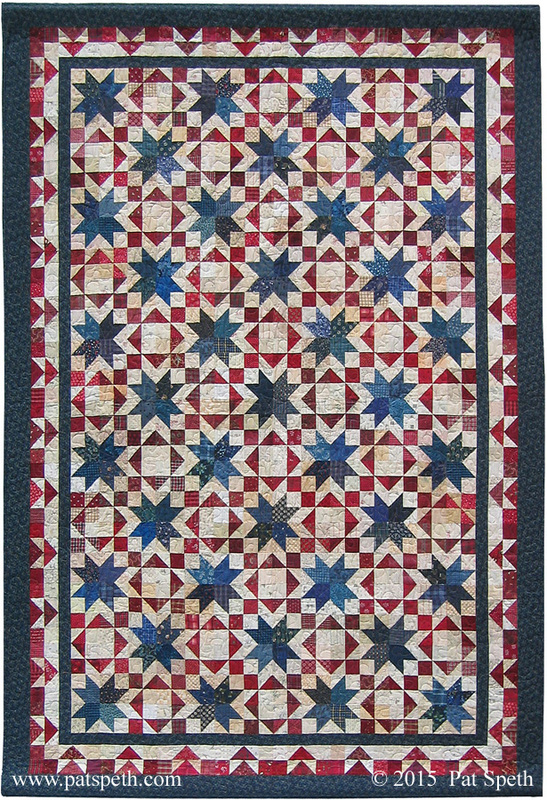 Chesapeake is an individual pattern and Dawn to Dusk is found in my More Nickel Quilt book as well as The Big Book of Nickel Quilts. 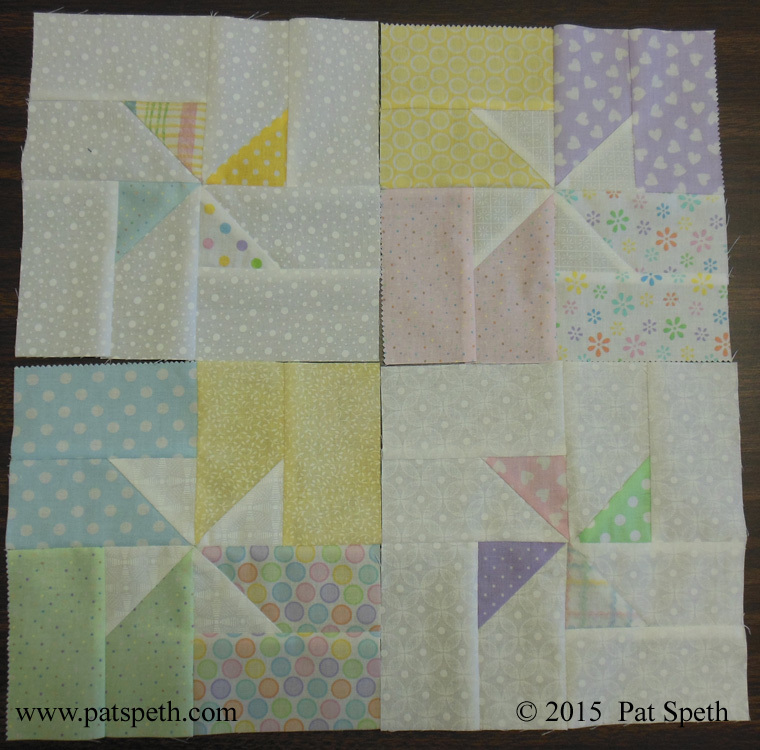 These three different sets of blocks are all for the Pinwheel on Parade quilt. 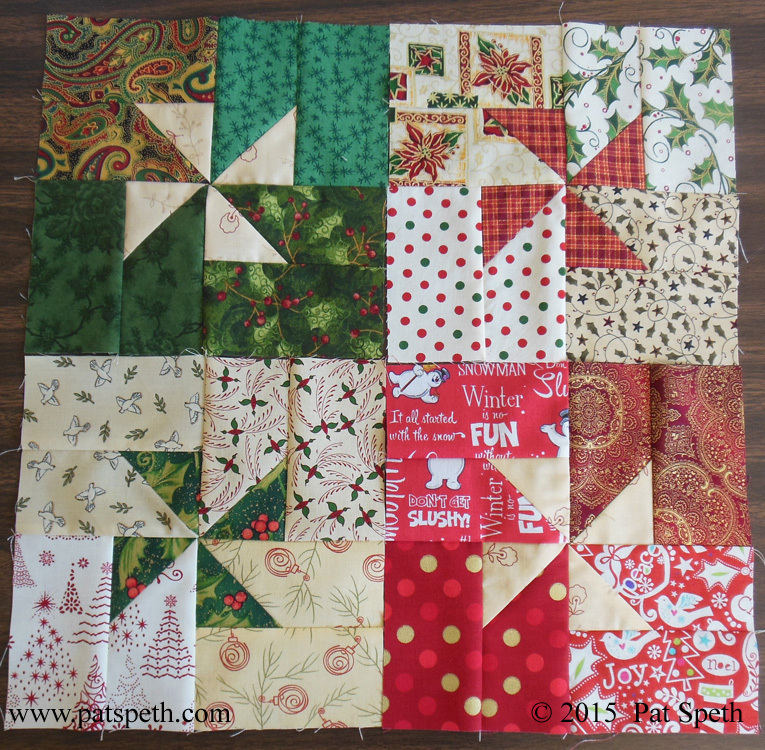 The fabric choices were; Christmas prints, pastels for a baby quilt, and batiks. 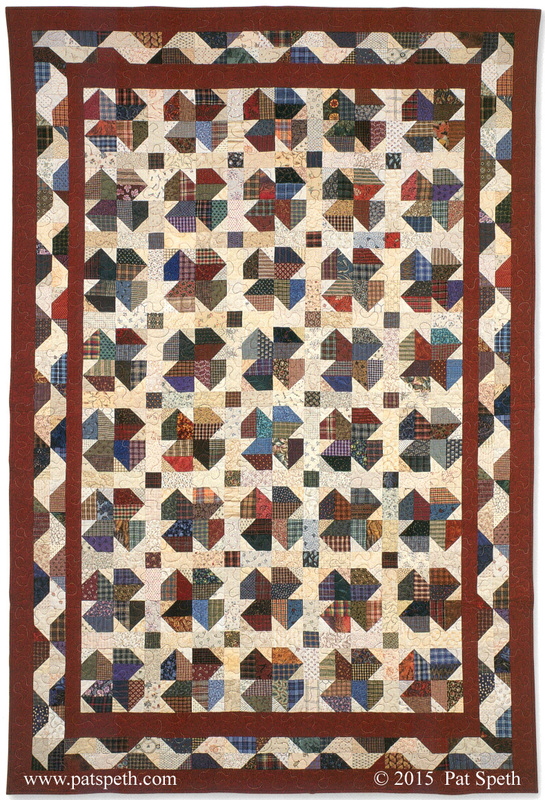 Pinwheels on Parade is from More Nickel Quilt book as well as The Big Book of Nickel Quilts. Below are some Woodland Clover blocks. 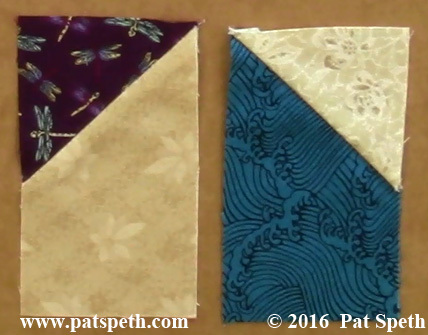 The first set is very much like what I made for my quilt and the second block is a good example of controlling the fabrics more within one block. 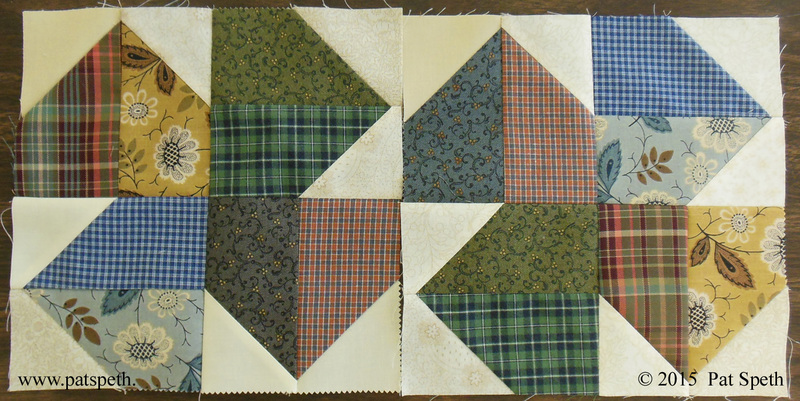 In this workshop I did find a kindred spirit, a quilter using plaids from Upcycled 100% cotton shirts! 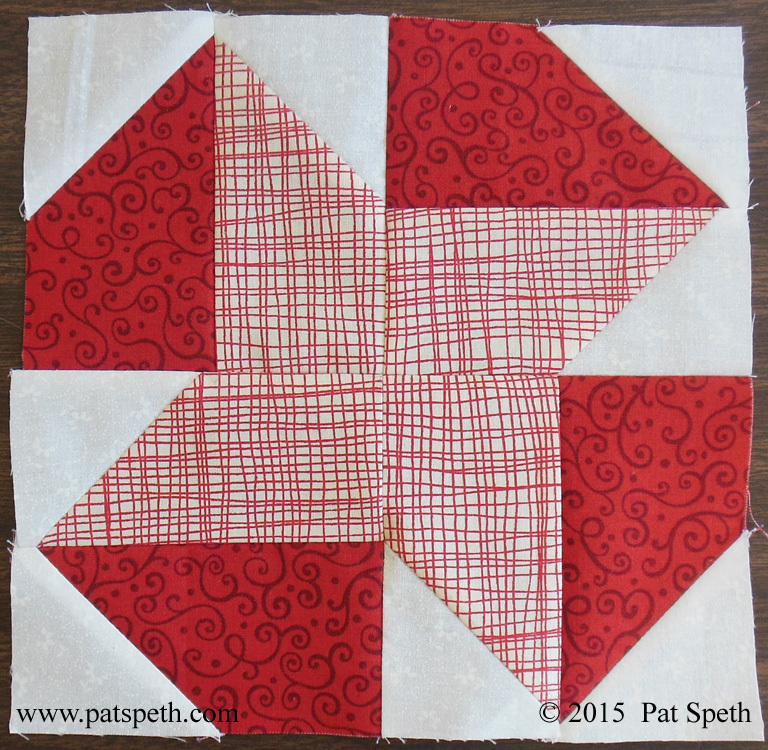 As always, I am looking forward to seeing some finished quilts from this workshop! What a great conference this was! A wonderful setting, great students, and a team of volunteers that put everything together for all to enjoy. 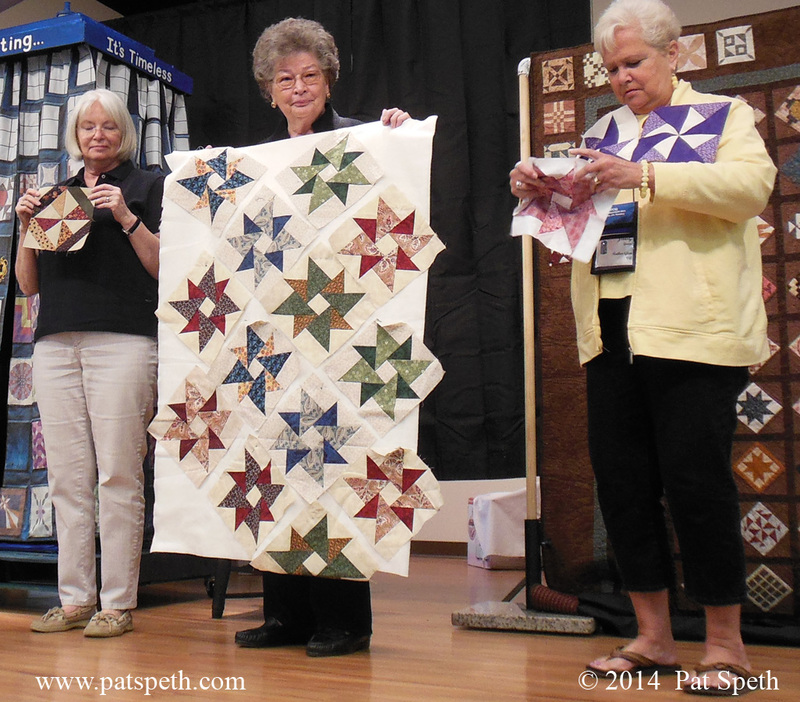 On the last day everyone enjoyed a “show and tell” of accomplishments from the workshops. Below are two pictures from my Combination Units workshop. 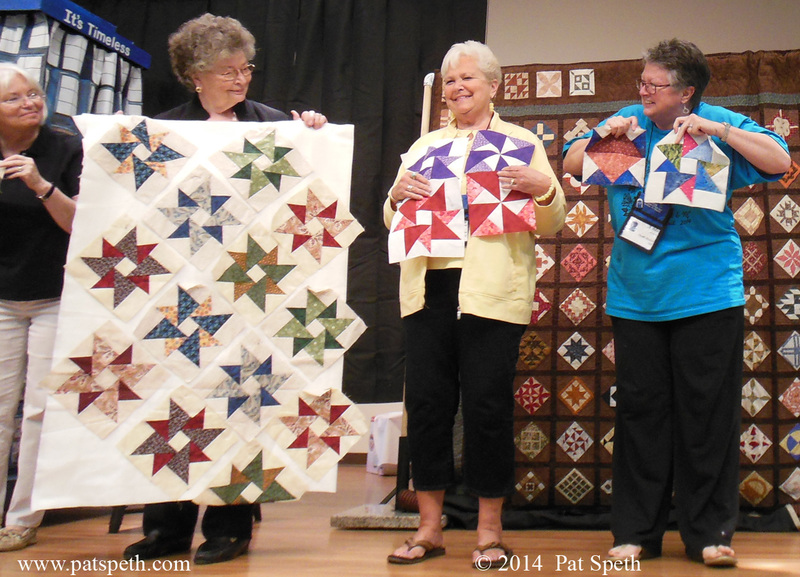 Four participants share the blocks they worked on during this workshop in which seven different quilts can be made! 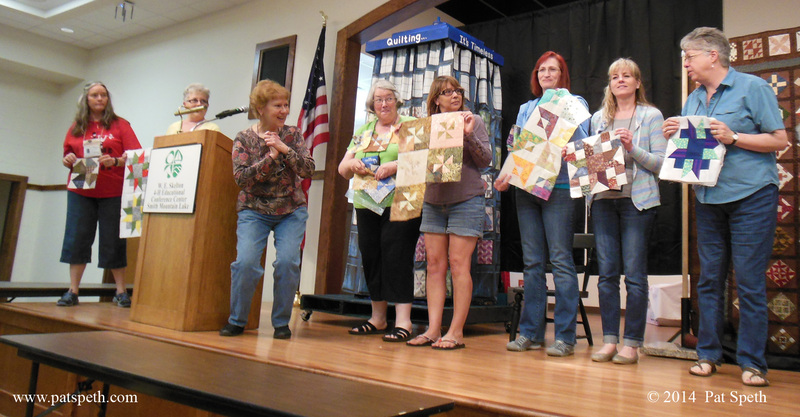 Many more brave quilters joined me up on stage to show their blocks from the Picket Fence unit workshop. Can you tell I’m really excited! 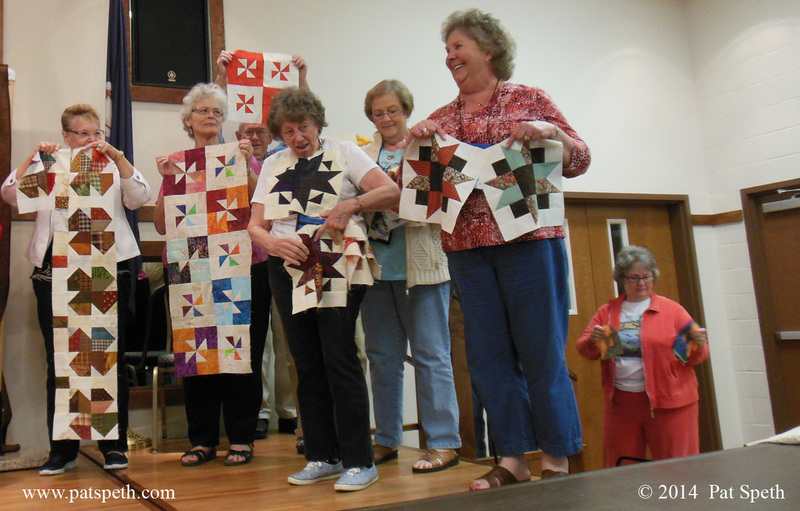 In this class they had five different quilts to choose from and then I handed out sheets on several more variations they could make on the Dawn to Dusk or Chesapeake quilt. A few of the participants decided to make one of the variations. 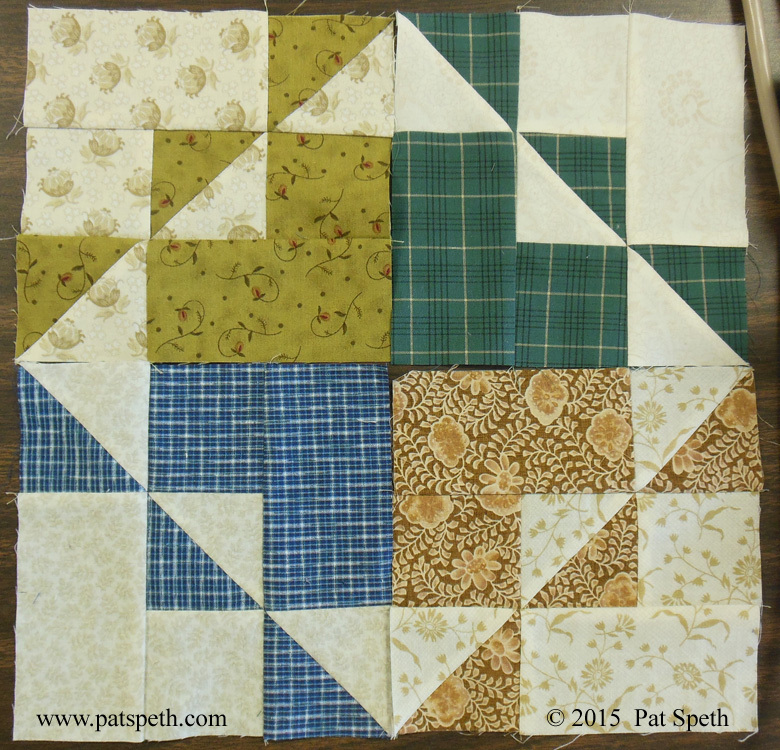 What fun, to think you are going to make one quilt and then be struck by inspiration and design options and then to be able to “just go for it” because the 5″ squares are so versatile! 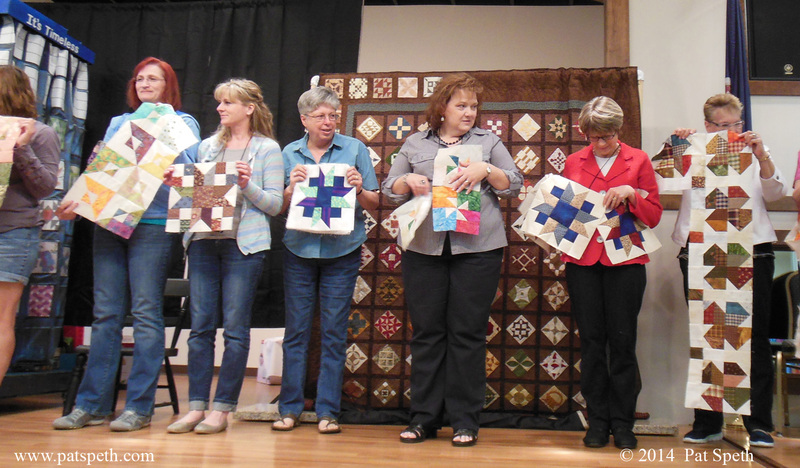 There were so many quilters sharing their blocks from this class that not everyone even made it up on the stage before the pictures were taken. A teacher’s dream! 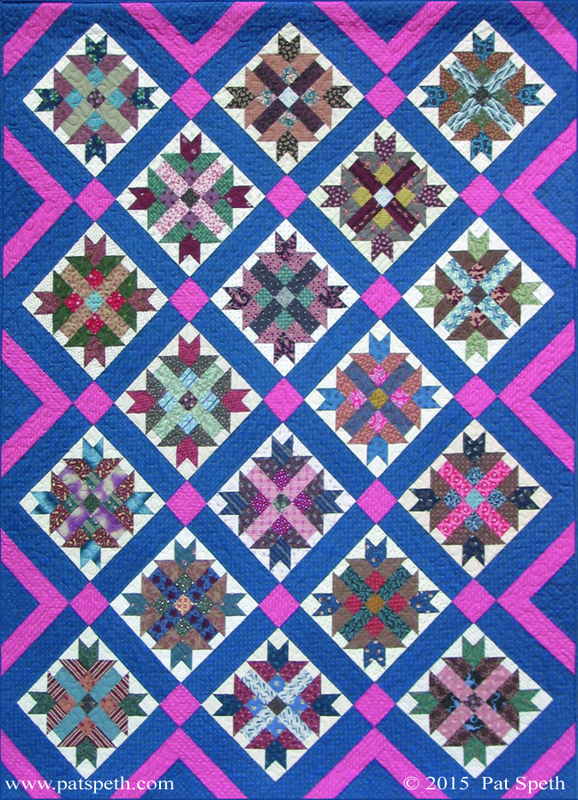 Besides the Dawn to Dusk and Chesapeake variations I also display on the design wall and give a handout on 40 variations on the Millennium Star Block. Is there a limit to what we can do with a 5″ square? I don’t think so!